This year Hanukkah comes to a close tomorrow, December 5, at night-fall. The familiar – at least in name – celebration commemorates the rededication of the Temple which the Jewish people wrested back control of from the Seleucid Syrians during the Maccabean Revolt. 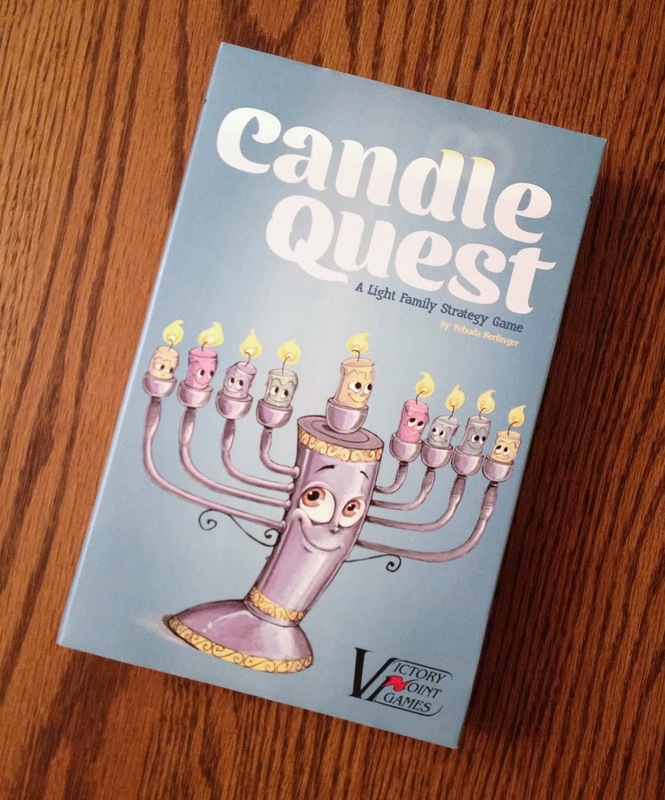 Today I review Candle Quest, a light card game not about that revolt or politics or history; but instead acquiring candles with which to light the menorah so famously associated with the holiday. There may not be any tactical, political intrigue and big battles. But you’ll need a dash of strategy in spending your shekels wisely before your opponents snuff you out. Rarely has such a little title made a simple game sound more epic! In Candle Quest, players are trying to collect eight different candles by buying, selling, and auctioning the little wax sticks in a race to complete their personal menorahs. A deck of candle cards is shuffled and each player begins with 12 shekels behind a privacy screen. Candles come in eight colors and have varying face values – one number indicating its cost and a second its selling price. On your turn, you may either flip a card from the top of the deck or loot a previously sold candle. Both actions are resolved differently. 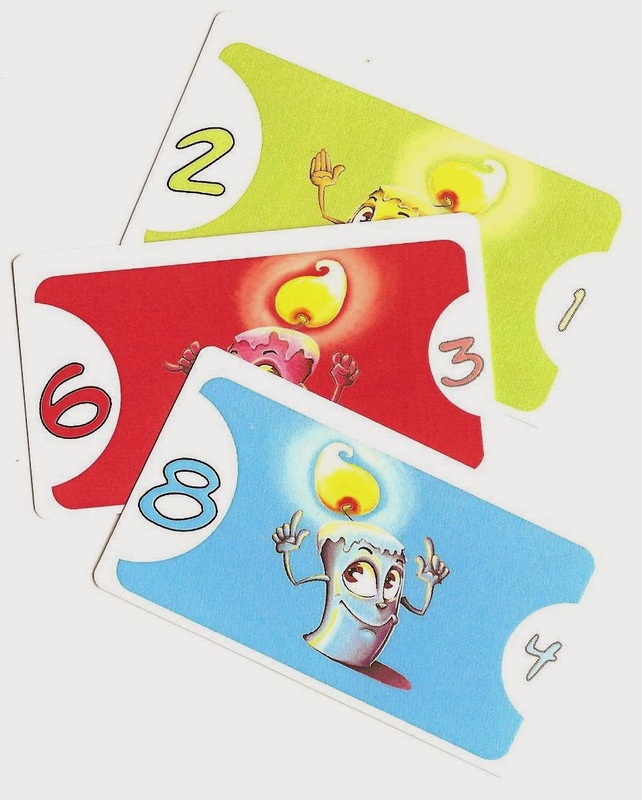 When drawing a candle card, you can either buy it straight up for its listed purchase price, paying the proper amount in shekels and adding the card to your “menorah” behind your player screen. Or you can sell it for the smaller value indicated, taking that amount from the bank and placing the card in your trash pile in front of your screen. Candles, shekels, and a couple player screens. Alternatively, you can put the card up for auction. In that case you begin with an opening bid. However, you only get that one bid. After your initial ante, each player in turn has the opportunity to bid higher than previous offers. After all players have bid or passed, the highest bidder wins. If that is you, then pay your bid in shekels to the bank and take the candle. If it is another player, then that individual will take the candle. However, he/she must then pay you the amount bid. If you decide to loot a discarded candle, then you do not draw a card on your turn. Instead, you may purchase the top card from any trash pile, including your own. There are two special rules involved with looting. First, you must pay an amount equal to its combined purchase and sell value. However, second, you can pay all or part of that cost with one or more of your previously earned candle cards. Simply discard a candle, or candles, of equal value; or discard a candle card and then pay a number of shekels required to make up the difference. Finally, there are two special cards. First is the ubiquitous “wild” card, known here as a Dancing Candle. The rules for acquiring them are the same as with normal candles. Second, there are a handful of Unlit Candles. If you draw one of these, you must discard one or more candles equaling the unlit candle’s value, pay that value in shekels, or use a combination of candles/shekels in a similar fashion to looting. If you’re able to discard/pay the required amount, you get to keep the unlit candle and take another turn. It won’t help you complete your menorah, but you may be able to use it later in looting. If you cannot pay the full amount, then you must instead discard your highest candle or pay in all of your shekels, get rid of the unlit candle, and forgo the bonus turn. In the base game, the first player to collect one candle in each of the eight colors wins. There is an advanced variant in which players earn points based on the face value of their collected candles, plus shekels, with a bonus for having completed their menorahs. In this version, the player with the highest score wins. There is also a very basic version which omits the auctions and looting, recommended to introduce the game to the youngest of players. 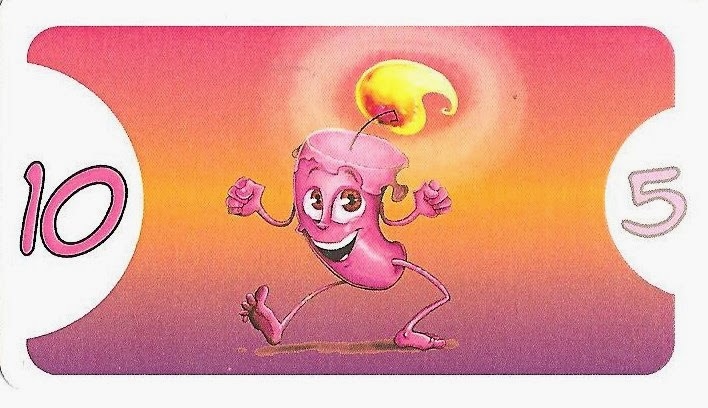 The wild and crazy dancing candle! Burning Brightly or Flickering Out? Bidding is one of the more difficult mechanics for children to grasp. I’ve even gone on record against auction games for kids. The basic technique may be well and simple. But the larger intangibles are not. Objects in any auction are always worth only what players are willing to pay for them. Therefore, it is easy to overbid unnecessarily. Plus, there is a “game within the game” of trying to artificially drive up the price of something you know an opponent wants, while trying to guard against another using the same tactic against you. This can really frustrate kids. Candle Quest is a rare exception to all of that – for several reasons. First off all, the auctions are extremely simple and fast. It lasts one round and you get one bid. There’s no multi-round gamesmanship. There’s no hemming and hawing and hesitating indecision. And while it’s still possible to artificially drive up the value of a candle you know another player wants, it’s harder to pull off and you have to have the money yourself to do so. I think the main difference to this design’s bidding is that the personal value of a candle is determined by colors – at least in the base game. Therefore, the worth of each card varies quite a bit from player to player, especially as the game progresses. While there is more contention over candles in the early game, the interaction starts to diminish as everyone increasingly fills out their menorahs. Rather than being anti-climactic, this element reduces stress and anxiety that kids might feel from not being able to acquire what they need. That tension is replaced with the mystery of drawing or looting the right cards and having the necessary shekels on hand when the opportunity arises. Another benefit to Candle Quest’s bidding mechanism is that the starting player earns the money if they lose. One, that makes opening up an auction an attractive option to earn money, especially if its selling value is pretty low – you’ll usually make more money from an auction as opposed to just straight up selling it. Two, if you lose out on a bid, you get the winning payment as a consolation. Both of these aspects are attractive because you want lots of shekels. Being able to buy outright any flipped card or discarded candle is the surest way to secure what you need. Now, cutesy art aside, Candle Quest is not just for kids. It also works as a sophisticated filler – primarily because it’s also a game of hidden information. When bidding, you mostly have just your good (or poor) memory to guide you, not knowing exactly how many shekels your opponents have nor which candles they still need to complete their menorahs. All of this keeps the auction process smooth and still tosses in a nice element of bluffing and deduction. Plus, you can always buy cards that you know someone else wants, just to keep it from them. Or you can use an auction to try and buy a candle for less than its original purchase price. Kids are likely to struggle with these parts of the game, but it will be right in hobby gamers’ wheelhouses. On top of the basic rules, you can add the advanced variant which makes bidding for higher value candles more interesting and nuanced. I would be remiss to note that, as a card game, luck of the draw does play a factor. Early on, it’s not as noticeable since your menorah begins empty. Therefore, just about any card will do. Plus you can use the auction to coax shekels out of other players. Randomness becomes more acute as you and others fill out your menorahs. 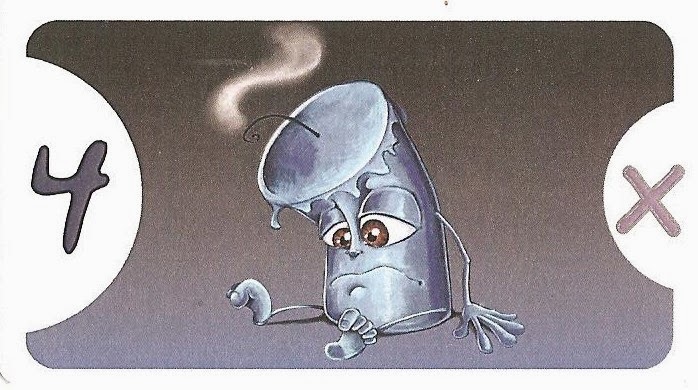 However, the obvious situation where bad luck is annoying is when drawing an unlit candle without the having the shekels to pay for it, thus losing a candle as a result. The components are all fair. The cardboard shekels are good, while the cards and player screens are a tad on the flimsy side, but certainly serviceable. The player screens do have helpful references. The illustrations are cute and imaginative. When my 6-year old daughter first spied the animated menorah on the box art, she immediately beamed, “I want to play the Beauty and the Beast game.” So it will serve well to attract the younger crowd it generally targets. At the same time, it will likely deter older gamers in peer settings. Not to mention there are many other light, auction games for adult hobbyists already established (For Sale, Money). Purchase price on the left, selling price on the right. In any event, Candle Quest is still a kid’s game at heart. In fact, it is a re-theme of the monster building game, It’s Alive!, by the same designer. The two titles have essentially identical rules, while the former’s artwork is not so gruesome. 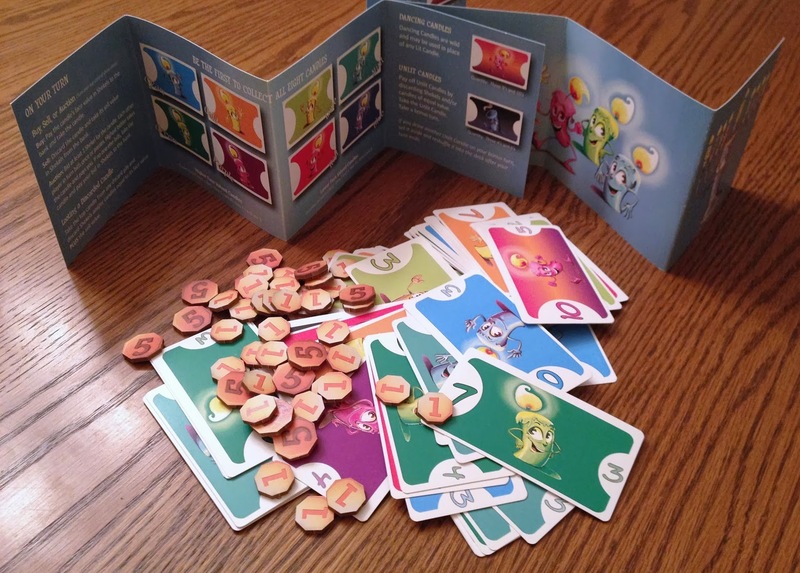 As a result Candle Quest is a delightfully fast, light, and simple bidding game perfect for introducing children to the genre, as well as new family and casual gamers, while still offering some depth for experienced players to enjoy. iSlaytheDragon would like to thank Victory Point Games for providing a review copy of Candle Quest.